Time to take another step on your journey to Break Free from Billing by the Hour. Most of the people joining me on Going Digital are Successful Coaches, Consultants, Speakers or Trainers who work IN their business and deliver their services and products in person. That is: they bill by the hour. Growing your business is a matter of selling more hours, or selling at a higher rate per hour or employing suitable trainers, coaches or consultants to effectively clone themselves. But in the case of the latter, quality is often sacrificed. And sometimes, you employ someone in good faith who leaves after learning all your IP and then sets up in competition. Selling more hours? Well that's just exhausting. Selling at higher rates? Now that's cool, if you can sustain it. But it still means that you do the delivery. And, yes I know that you love doing the delivery. I do too! But I've grown tired of the excessive travelling, the hotel rooms, missing my family. And let's be honest here, I get tired sooner than before. Gone are the days of running workshops or coaching 5 days a week before hopping on a flight for a few hours at home before hopping on another flight to do it all again. And once I was hospitalised. I couldn't finish the workshop. Sure I got the blessed chance to return and finish a few months later, but what if I couldn't have done that? Heck, I hadn't even taken a sick day in 26 years before that. Even losing my voice wasn't a possibility. If I depend on someone else to create my future when something goes wrong, then I know that I will be disappointed. 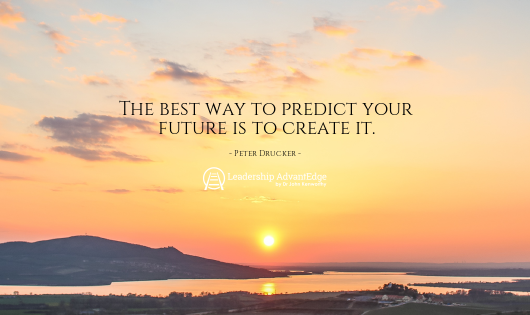 So I take Peter Drucker's advice: If I want to secure my future, I have to create it. And the best way to do that, for me, is to create products out of my service. What would happen if you couldn't deliver your workshops, your coaching, your advice? How will you grow your business so that you can enjoy choosing your work in retirement? If you don't create a product out of your knowledge and service, will you continue to be able to sell your in person hours? Wouldn't you like to break free from billing by the hour? You need to productise your knowledge and services now. And you need to Go Digital. Sure, you can write and publish a hard back tome of brilliance. And you might, just might become a mega-millionnaire off the back of it. But the chances are that you, like 99% of all authors, will spend more writing and marketing your book than you will make from it. But an eBook? Now that can be a very different story. Going Digital is a 9 month long Protege Programme. I know, it seems like an eternity and I understand that you want to do this last week. And, yes, I know that nearly everyone else in this space will promise you results in a few weeks. They also promise that you can make mega bucks overnight and that there is no effort. And I suspect that you have fallen for one of those before and you're especially anxious not to make the same mistake again. And then you may be worried that you'll choose the wrong platform and waste a whole heap of mopney and time. And you may be thinking that you really don't know where to start. I know. I've been there. And I have kindly made all of those costly mistakes on your behalf. It wasn't deliberate but at least I can turn my mistakes into your advantedge. And that's just what I have done for you. We start with a 31 Day Challenge. You sign up for this at a very favourable price. I'll drip feed short content to you. You'll receive an email from me every morning, with links to our private course members website. You can read the lesson for the day, listen to it on your mobile device, and sometimes, watch a short video. Every day, you'll have a small worksheet to use and complete. It will take you one small step forward with laying a strong foundation for your Digital Product. Each day is one small step towards that solid foundation. How you will build it. On top of this, you'll know that this is right for you so that you can work ON your business instead of IN your business. Then you can choose to continue working with me on the rest of the Going Digital Protege Programme or go it alone or even go with someone else. Obviously, the best choice is to continue working with me, and then I will DISCOUNT your investment in the 31 Day Challenge from your investment in the Protege Programme. I am only working with a small, select group each year on the Protege Programme because you and I will be working very closely together for the next 9 months. My job is to support you as best I can and for that, I need to protect the time I have available to make sure that you are supported fully. Join the 31 Day Challenge today and choose to break free from billing by the hour. Mar 25 John K and 1 other replied to Saying "Hi"